1. One-Arm or Two-Arm Topology? A one-arm topology is the most simple design and is suitable for most environments where IP routing (Layer 3) switches or routers link client and server subnets. A two-arm topology can be used to obscure servers by sitting them ‘behind’ the NetScaler devices, form a security perspective all client traffic must pass through the NetScaler in order to reach the server. Arguably this may or may not improve security. A one-arm topology is probably easiest to implement as you dont need to re-cable or redefine any networks in order to create the second network required by the NetScaler for a two-arm deployment. 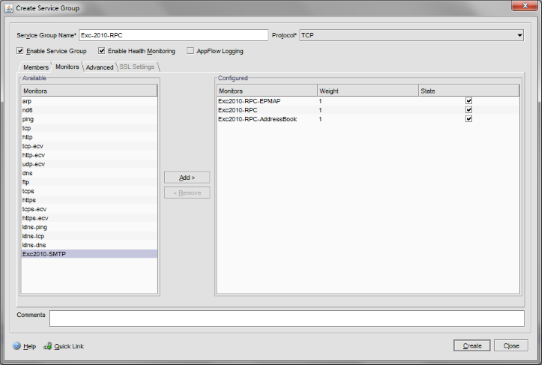 It is definately the quickest way to get a NetScaler into a production Network with minimal changes. 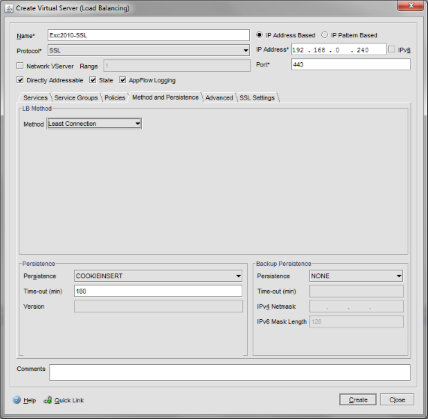 That said, your environment may demand a two-arm topology, for example if you want to use VMACs this requires Promiscuous mode to be enabled on the vSwitch, this is not idela on a large-scale subnet that all servers share, so it’s better to define a seperate subnet for VMACs/Virtual Servers to use. There is no need for either topology to use a public network address space on any interfaces, NAT is a perfectly reasonable alternative to what is depicted in any of the design scenarios in the Citrix eDocs. 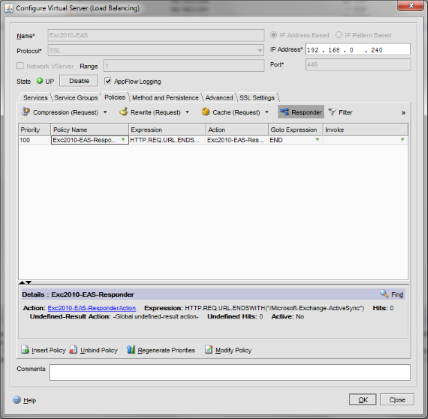 For load balancing most Exchange 2010 environments that consist of CAS/HT and Mailbox servers either topology will work. I have deployed a single NetScaler device, NS1 which is configured with IP address 192.168.0.230/24. Using multiple IP addresses also facilitates interesting Active/Active configurations using VMACS which I’ll cover in a later guide. All servers and clients are a member of the domlocal.net domain, using IP’s from my chosen address space – you environment will be different so adapt scripts, commands, IP Addresses and names accordingly. So here are the first differences if you decide to go with a two-arm configuration; first create an assign VLAN’s to all Network Interfaces. 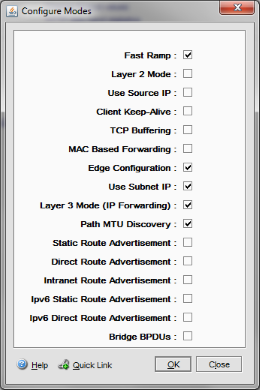 By default VLAN1 will be untagged on Interfaces 0/1 and LO/1 – don’t worry too much about the VLAN ID here, it can match you environment, it can also be random as it is ‘untagged’ any traffic entering the Interface or leaving it will not actually be tagged with the VLANID you select. 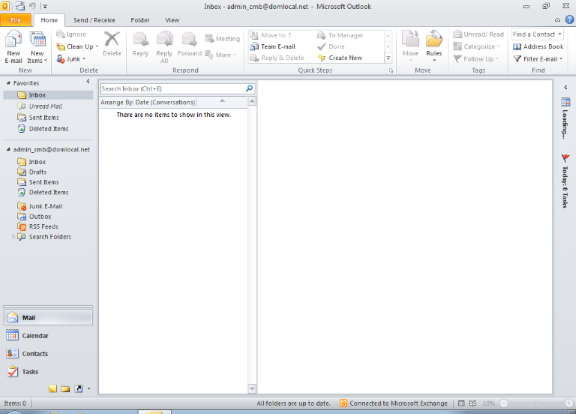 You need to deciede upon an address space, for the purposes of this article I’ll use 192.168.209.0/24. 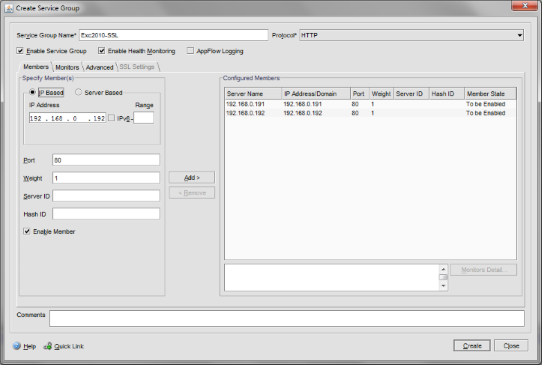 Importantly this is a routable subnet, both clients and servers can access this address space, unrestricted. Our Exchange 2010 Load Balancing configuration will require several core features that the NetScaler supports; Load Balancing (! 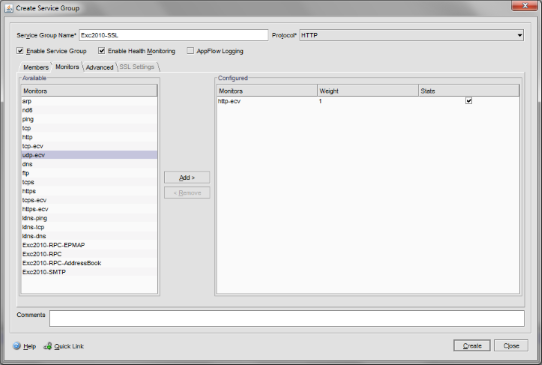 ), Rewrite, Compression, SSL Offloading and Content Switching. We’ll be leveraging the Responder feature so we must enable this. 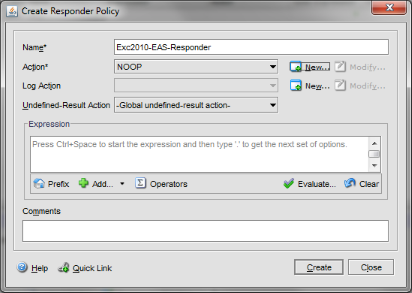 Ensure that the Responder feature is enabled. As we’re using the SSL Offloading feature we need to import the SSL certificates that we would have used on the Exchange Client Access Servers. It may even be necessary to generate a valid certifiate. 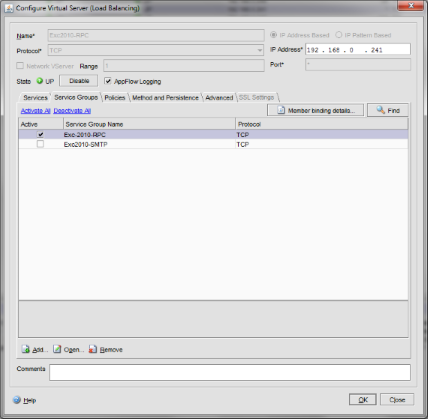 You’ll need to either complete this request using a local Active Directory Certificate Services CA, or a third-party CA, when you have completed the request on all Exchange Servers you intend to Load Balance export the Certificate, with Private Key in PFX format ready to import to the NetSCaler device. 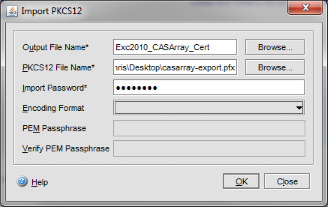 Enter a name for the certificate “Exc2010-CASArray_Cert,” browse for the PFX file (if you used the commands earlier this will be C:ExportCert.pfx) and enter the password you used when exporting it. 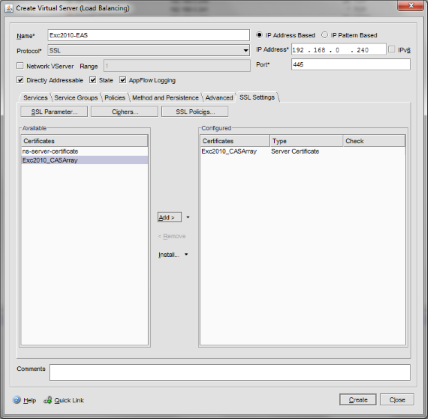 The last step for preparing the SSL certificate for use is to Install it. Browse to SSL > Certificates and select ‘Install…’ at the bottom of the window. There are a few jobs that must be completed in order to successfully offload SSL. Set-WebConfigurationProperty -Filter //security/access -name sslflags -Value "None" -PSPath IIS: -Location "Default Web Site/OWA"
Set-WebConfigurationProperty -Filter //security/access -name sslflags -Value "None" -PSPath IIS: -Location "Default Web Site/ECP"
Set-WebConfigurationProperty -Filter //security/access -name sslflags -Value "None" -PSPath IIS: -Location "Default Web Site/OAB"
Set-WebConfigurationProperty -Filter //security/access -name sslflags -Value "None" -PSPath IIS: -Location "Default Web Site/EWS"
Set-WebConfigurationProperty -Filter //security/access -name sslflags -Value "None" -PSPath IIS: -Location "Default Web Site/Microsoft-Server-ActiveSync"
Set-WebConfigurationProperty -Filter //security/access -name sslflags -Value "None" -PSPath IIS: -Location "Default Web Site/Autodiscover"
New-ItemProperty "HKLM:SYSTEMCurrentControlSetservicesMSExchangeABParameters" -Name "RpcTcpPort" -Value 59601 -PropertyType "String"
New-ItemProperty "HKLM:SYSTEMCurrentControlSetservicesMSExchangeRPCParametersSystem" -Name "TCP/IP Port" -Value 59600 -PropertyType "DWord"
Monitors are what the NetScaler uses to confirm services on remote servers are actually up – you wouldn’t want the NetScaler to try and use an Exchange Server that has crashed, so Monitors are used to verify remote service functionality; we need 4 Monitors for our Load Balanced Exchange 2010 environment. 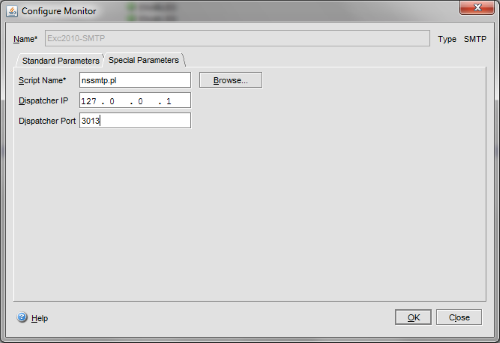 Browse to Load Balancing > Monitors then click ‘Add…’ at the bottom of the window. 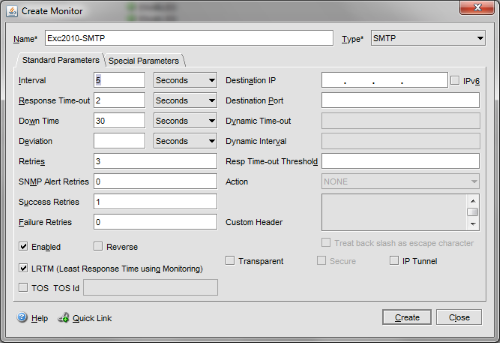 The first Monitor will be called ‘Exc2010-RPC-EPMAP‘ – this is used to verify TCP port 135 connectivity on the Exchange 2010 CAS’. This port is used to negotiate the RPC port that the client will connect with. The next Monitor will be “Exc2010-RPC-AddressBook” – this will monitor TCP port 59601 which is the client RPC connection to the Address Book service. The final Monitor will be called “Exc2010-SMTP” – unsurprisingly this will monitor TCP port 25 on the Hub Transport servers. 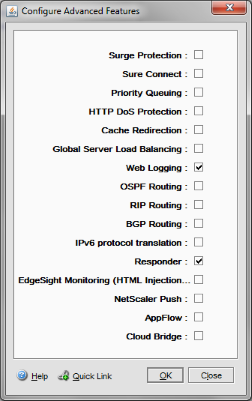 For SSL/HTTPS service verification there are built-in NetScaler Monitors we can use rather than defining new ones. 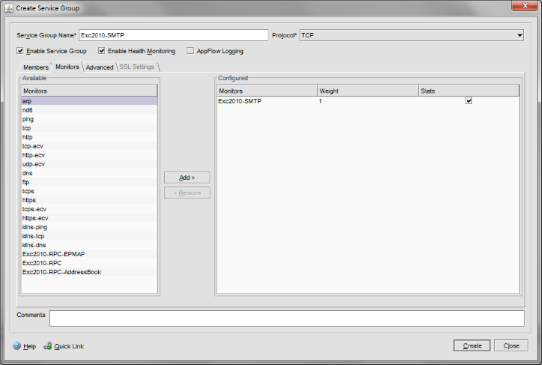 Browse to Load Balancing > Service Groups. 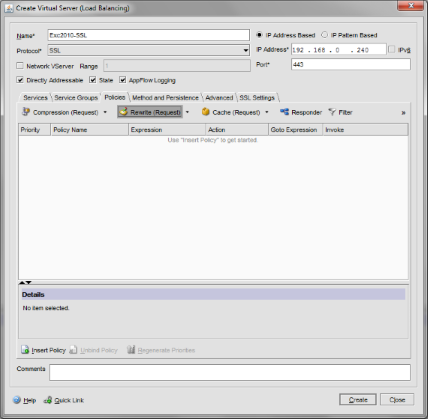 We now have all of the foundations in place for our Exchange 2010 Load Balancing, it’s now time to create the Virtual Servers to which clients will connect to. 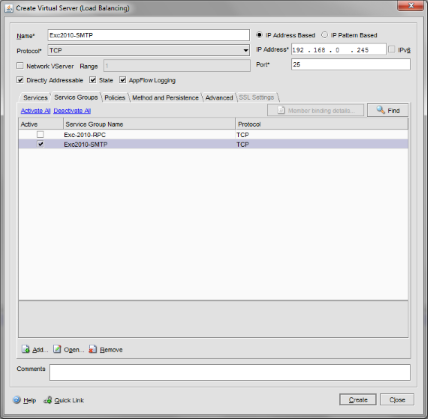 Browse to Load Balancing > Virtual Servers. 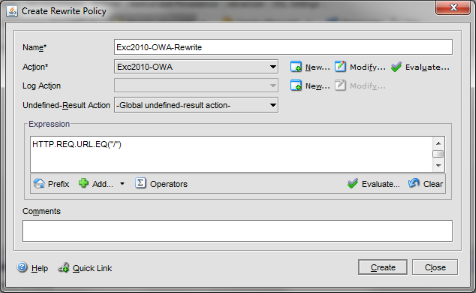 Select the “Policies” then Rewrite (Request), then click Insert Policy near the bottom of this window. You may be wondering why we’re using port 445 as Exchange CAS/HT servers don’t listen on this port for Exchange Active Sync. This is where the NetScalers come in. We can setup a Virtual Server on any IP, on any port, then bind it to a real service on a remote server that is on a different IP address and port. 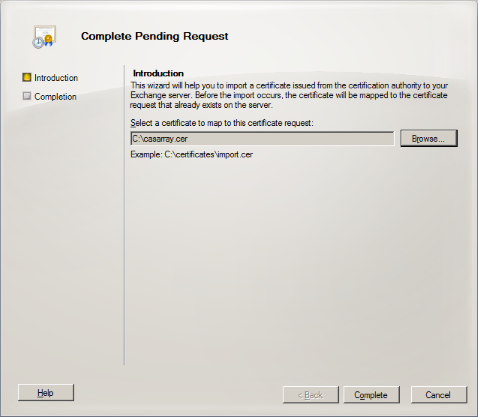 We’ll configure a redirect that points any Exchange Active Sync requests to this Virtual Server which in turn applies the correct Persistence type to the client connections and then sends all requests back to the CAS IIS instances running on port 80. Still confused? … just bear with me for now! 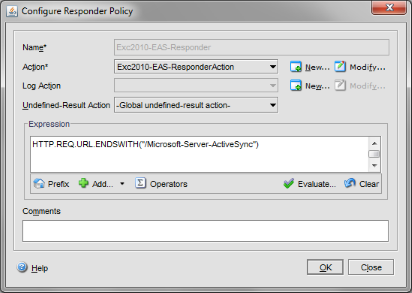 Under Policies select Responder, then click ‘Insert Policy” > New Policy – here we’ll create the redirect that tells clients to use the EAS Virtual Server for Active Sync data. We use a responder because Responder Rewrite that a Responder should be used to redirect a client, not a rewrite. 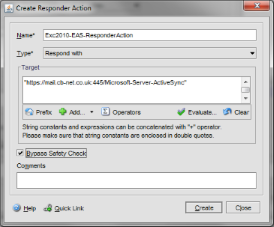 Click Create to complete the responder action. IP Addresses are the only variation in the configuration required for a two-arm setup. Your new Content Switching Virtual Server is ready to redirect! So you are probably wondering how you users will actually use the load balancers… thats where the Exchange 2010 Client Access Array comes in. Essentially we define a CAS Array and bind it to a mailbox database, therefore all mailboxes within the mailbox database will (via Autodiscover) use the CAS Array. If you manually configure a profile you must use the Client access Array once it has been assigned to the mailbox database. 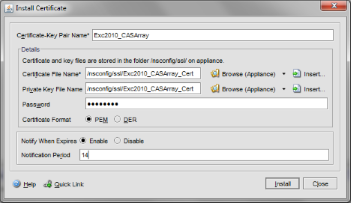 A design consideration when deploying Client Access Array’s is that there can only be one CAS Array per AD DS site. 12.3. 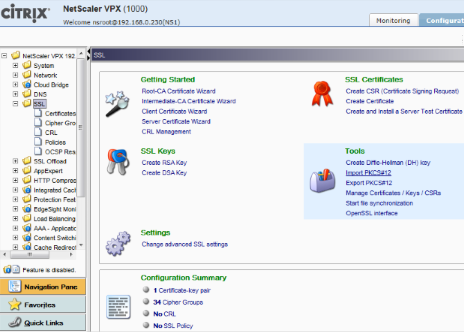 Save you NetScaler Configuration! Don’t get caught-out, ensure you save the NetScaler configuration! 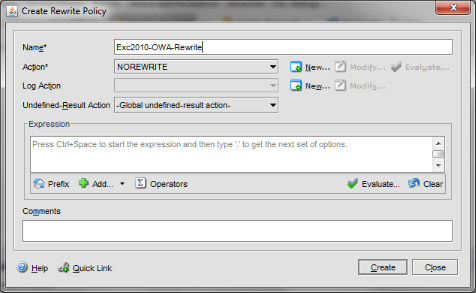 Create a new mailbox in the Mailbox Database to which you assigned the CAS Array. 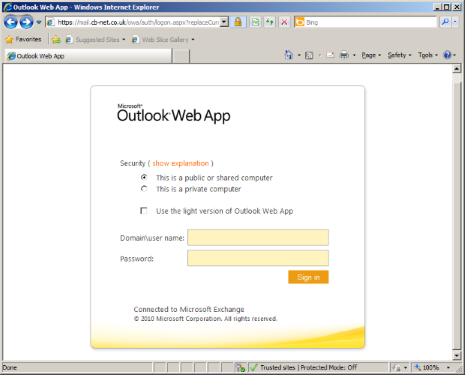 Test OWA functionality from a machine on the domain by browsing to http://mail.cb-net.co.uk – this should redirect to HTTPS and present the OWA login page. Test you can also login as the user you just created. 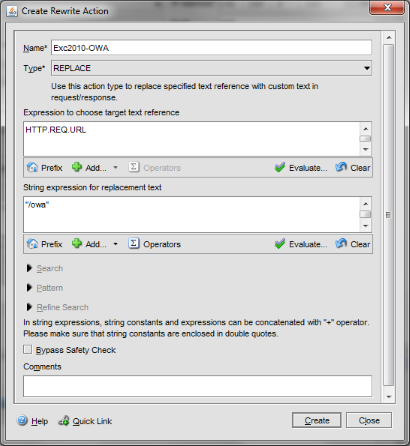 The NetScaler Single-Arm HA details how to configure HA for a single-arm NetScaler Deployment.